Crown of thorn plants (Euphorbia milii) are tropical succulents. Nicknamed for the fact that they have long thorns on their branches and stems, these plants are popularly grown as houseplants. They can also be grown outdoors in subtropical or tropical climates, although they are poisonous and should not be grown where animals can eat them. The crown of thorn plant is native to Madagascar and blooms with a profusion of small flowers surrounded by showy yellow, red, orange or pink bracts (modified leaves). Crown of thorns is a hardy plant that does not require specialized care. Choose a location that is exposed to full sun, whether you are planting the crown of thorns outside or placing it in a pot. Some hybrids will also grow in partial shade, so check the information on your purchased plant before selecting the planting location. Plant your crown of thorns in well-draining soil. This succulent will tolerate a wide range of soil conditions save very soggy soil, which will rot the roots of the plant. Potted plants should be planted in high-quality, well-draining potting soil in a container that has drainage holes. Water your crown of thorns deeply but sparingly. Use a drip or soaker hose and let the water penetrate deep down into the soil. Do not water again until the soil has almost dried out. The soil should be dry down to 3 inches or so before watering again. Use water that is at room temperature and never get the leaves or flowers wet when you water, as this can cause fungi growth. Keep your crown of thorns plant warm. They are tropical plants, and they thrive in temperatures above 60 degrees Fahrenheit, although they can survive brief cold spells as low as 35 degrees. Potted plants can be set outside and brought inside if the temperatures drop too quickly. Remove any dead leaves or flowers to maintain the look of the crown of thorns plant and prevent possible fungi from developing. Fertilize once in the spring and once in the summer with a balanced (10-10-10), water-soluble fertilizer. Do not over-fertilize or the plant will not bloom. 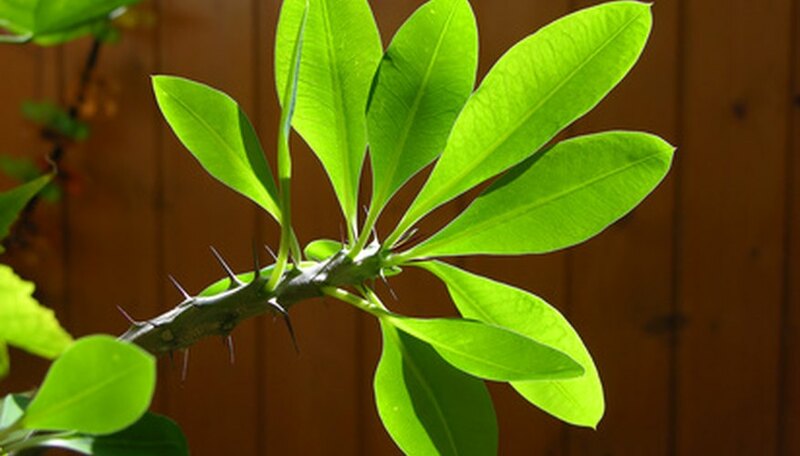 The milky white sap of the crown of thorns is poisonous and may cause a painful rash if it comes into contact with bare skin, so wear gloves and use caution if you prune the plant.